Help CentreUsing SuperControl Managing bookingsHow do I cancel a booking? 3. Click the red "Cancel" button and click "Cancel booking". 4. 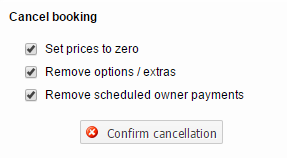 You can choose to set prices to zero, remove options/extras and remove scheduled owner payments (Agency only) before you "Confirm cancellation". Next: How do I charge a cancellation fee? A deposit has been paid for a booking through Holiday Rent payment and they have changed the booking to another property. How do I move the payment across please? Then you can add the new set of dates onto the same booking by clicking the Add dates section (click here for help: http://help.supercontrol.co.uk/m/using-supercontrol/l/732249-how-can-i-add-additional-dates-properties-to-a-single-booking).